Gentle Readers, the polls are open and will stay open until 8 pm. Today voters in Ypsilanti and Ann Arbor will be selecting a candidate who in all likelihood will be the next mayor. Please vote. 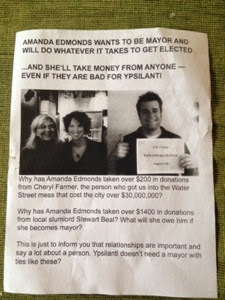 EJ and I awoke to find someone had left an anonymous flier smearing Ypsilanti mayoral candidate Amanda Edmonds. The flier specifically criticizes the fact that Edmonds has taken donations from former Ypsilanti Mayor, Cheryl Farmer and local landlord/developer Stewart Beal. It ends with the ominous question: "Ypsilanti doesn't need a mayor with ties like these?" Spooky. Ann Arborites, are you seeing any dirty tactics over there in western Washtenaw County? Have you noticed many web and/or Facebook ads for candidates? This primary election is just the tip of the iceberg in terms of campaign 2.0 tactics for local elections. Wow...$1600. Politician souls must be cheap.